Has a tree fallen in Costa Mesa damaging your home? Homes can take a severe beating from trees falling in Costa Mesa, California. When you're experiencing property damage from a tree falling due to saturated soil, heavy winds, storm damage or simply the age of a tree, call West Coast Restoration Inc for immediate property remediation after the tree damage in Costa Mesa. Our expert team of restoration contractors have been restoring properties after tree damages have occurred for over 29 years, and we will be there for you when you need us most. What many homeowners don't realize is the extent of damage that a fallen tree can cause. Your roofing, siding, windows and more can be greatly affected by a downed tree in Costa Mesa. There are many restoration contractors you can call when your property is suffering from tree damage, but when you call West Coast Restoration Inc, you'll be choosing a company with over 29 years of experience restoring property damages in Costa Mesa from trees. We are standing by 24/7 for emergency service, so we will be there when you need us most, regardless of the hour! Upon arrival, our Costa Mesa tree damage specialists will begin working on reducing further property damages from occurring. We will then begin the restoration and rebuilding process using only the highest quality materials, to get you and your family back to normal ASAP. 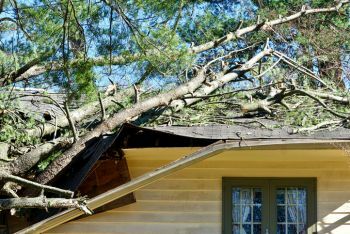 Whether a tree has fallen onto your property from tree roots that have become diseased or you were surprised by high winds or a tornado, West Coast Restoration Inc understands that this is a devastating time for you. Put our 29 years to work for you and call the Costa Mesa tree damage restoration team who cares to get you back to normal as quickly and as hassle free as possible! Call (714) 584-4894 and leave the rest to West Coast Restoration Inc.